The Partisans’ Song, Zog Nit Keynmol, written in Yiddish by Hirsh Glik in the Vilna ghetto in 1943, has been translated into Noongar, an Australian indigenous language, spoken in the south-west of Western Australia. Jesse John Fleay, Senior Research Officer and Research Project Manager at ECU. 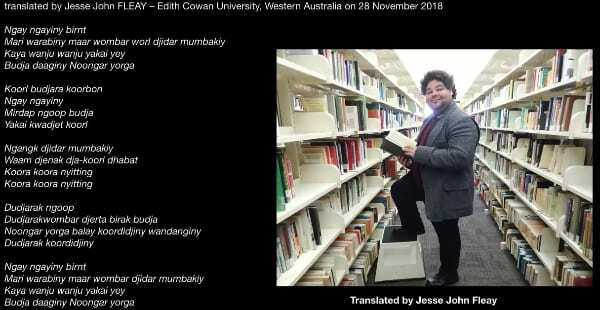 Jesse translated English into Noongar. There is a strong theme connecting the Jewish Partisans and William Cooper, the Aboriginal leader who attempted to deliver his protest to the Nazi consulate in Melbourne on 6 December 1938, just after Kristallnacht. This will be extensively covered when US educator Nance Adler from Seattle visits Perth next August. One of the immediate outcomes of this translation is that Ellenbrook Senior High School, a leading music speciality school in Perth, will collaborate with the project committee, and present an ongoing program of WE ARE HERE! events aimed at our multicultural school groups. Students at the school will learn and perform the Partisans’ Song in Noongar and in other languages. The school’s music director, Stuart Rhine Davis, will co-ordinate the music program. The project is also expanding uts global online collaboration classes with World ORT schools. World ORT is the world’s largest Jewish education and vocational training non-governmental organisation. Started in 1880, World ORT is today operational in 37 countries and helps around 300,000 students around the world. Several lesson plans will be offered to a global audience.